Typically, a large part of your day is spent in the office, so it is quite natural that you and some of your co-workers become thick friends.But, even though one may feel that they know their colleagues really very well, one is stuck when it comes to choosing a gift for them. You cannot just pick any gift; you need to pick something they will find useful and which will be in line with their interests and preferences and won’t offend them in any way. There is a very thin line differentiating colleagues with other friends. One cannot be as friendly with a co-worker as one would be with a friend from outside of work; but you are not formal and distant either. And, colleagues come in different types; they range from the back slapping mates to the ones with whom you share a moderate level of comfort. You need to keep all this in mind while choosing a gift for them. To begin with, make sure the office policy allows gifting co-workers, seniors and juniors. Planning the budget is extremely important. Budget depends on the friendliness quotient you have with the colleague and his/her position in the company. It is strictly advisable to stay away from anything personal- the list can include anything from clothing, shoe wear, perfumes, and inner garments. When gifting a colleague,give those items a complete pass that may offend the colleague such as a deodorant, a set of nail filers, etc. One should also not be gifting anything that conflicts their religious or sentimental values such as gifting non vegetarian pies to a strictly vegetarian co-worker or gifting a person stuff like cookies, cakes, pastries while she or he is trying to lose weight or a bottle of wine to a teetotaller. While postcards may not be the mode of communication anymore, picture postcards always steal one’s heart. Getting a picture of your co-worker and his or her spouse and children is anyday a welcome idea. Or if you share a great rapport, then the colleague won’t mind a picture of you two as a postcard on his desk board. A painting for the one who has a taste in art will be most appreciated. Get a little more innovative and go the picture to painting way. Get their picture painted on a canvas and make them feel truly special. Plants are something that are always appreciated and the freshness and green that they bring with them is always soothing to one’s senses. It can also be a symbol of the growing friendliness between you two over a period of time. Stationary items are another popular pick. They are never out-dated but only keep upgrading with times, are of most value, and easy to look for. Branded pens are the most popular choice followed by diaries, planners, and set of funky coloured marker pens. Business cards are something almost every person has but, people usually don’t have a nice case to stack them in. While there are umpteen designs ranging from quirky to the personalized, gifting a co-worker a sleek and simple card holder will always be put to good use for a long period of time. Having the knowledge of a cause a co-worker supports can let you buy a gift from the brand’s or agency’s merchandise like a postcard, diary, T shirt, hand bag, wallet, photo frame, lamp, etc. The list is a long and exhaustive one. You know that this is a cause close to his or her heart so the gift can be expected to stay dear to them as well. 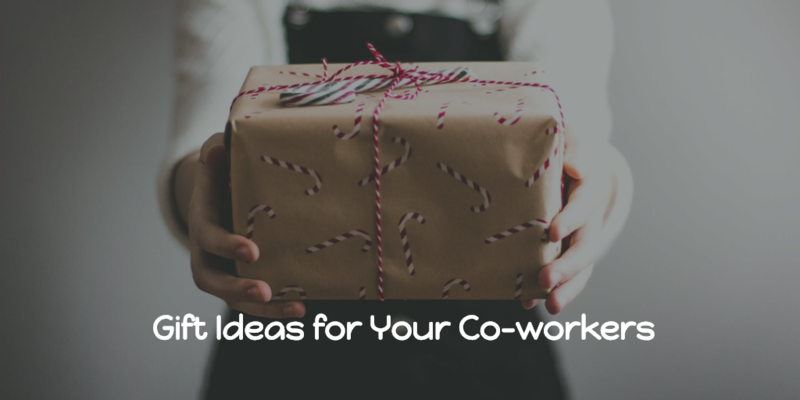 Hopefully, these tips will help you pick the perfect gift option for your co-worker.